The Birmingham Business Journal has an article featuring the success story of a small motorcycle helmet manufacturer, Helmets Inc., makers of the Caliber and Rodia brands. 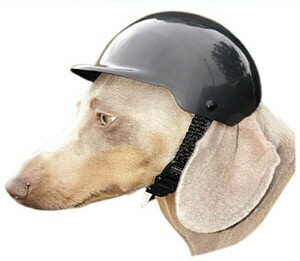 Yeah, they even make this dog helmet. It's a good read if you like business stuff. It kinda makes you want to start your own helmet company. Interestingly, the article says that brightly colored mohawk attachments are really popular. to design a "Captain America-style" helmet from the film "Easy Rider" was a shoo-in. Instead, it tanked. Funny, because I know a guy who has one just like it, and his girlfiend wears it from time to time.